Magician Seth Grabel to make official debut at our Tahiti Village sister resort this Sunday! It’s interactive! It’s early! It’s kid friendly! Last Sunday, in a rehearsal performance a week before his official Tahiti Village debut on Jan. 14, magician Seth Grabel wowed a roomful of invited employees and their guests with a seemingly inexhaustible supply of sleight of hand trickery, astonishing utensil manipulation, mindboggling levitation, and dexterous card virtuosity. He was also incredibly funny and engaging. 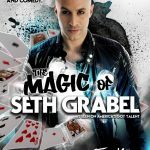 I was in the audience and can say, without reservation, that Seth’s sheer magic mastery compares with any Strip magician I’ve seen, and he surpasses them all where audience interaction, participation and fun are concerned. Seth never lacked for willing human props, and if they experienced any initial trepidation, he quickly put them at ease with amusing vocal antics (you have to hear it) and subsequently blew their minds with incredible how-did-he- do-that artistry. Watching him live, it is easy to see how Seth was an America’s Got Talent semifinalist and a guest on numerous other TV shows, including Animal Planet, EXTRA, and E! Seth’s show is decidedly family-friendly (the kids in the audience were completely captivated) and, with a 4 p.m. start, it’s a great way to begin your evening in Las Vegas. If you’re staying at Club de Soleil this weekend, I wholeheartedly recommend taking in the Seth Grabel show at our Tahiti Village sister resort. It is located at 7200 Las Vegas Boulevard South and Warm Springs Road and is just a quick 10-minute driver from Club. The show is inside the second floor Kahiko Room above Denny’s. Doors open at 3:30. Afterward, Seth will hold a meet and greet at 17 South Booze & Bites, the Tahiti Village bar and bistro located in the main lobby building. Tickets are available at the concierge desk in the main lobby or by calling (702) 440-6915. Get some before they disappear! 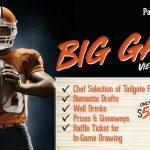 Enjoy all-you-can-eat and all-you-can-drink specials on Big Game Sunday at 17˚ South! Eat and drink till you can’t!